On the first day of New Year 2013, thousands of international visitors greeted Vietnam's tourism and enjoy many programs awarded to welcome international units by HCMC tourism sector. In the morning of Jan 1, 2013, Tan Son Nhat international airport were bustling with welcoming ceremonies for first group of international visitors to Ho Chi Minh City. HCM City alone on January 1 welcomed 465 air passengers travelling from Germany and Hong Kong (China). Among them were 315 passengers aboard Vietnam Airlines aircraft VN120 from Frankfurt, Germany, and 150 others aboard Cathay Pacific Airlines CX 767 aircraft from Hong Kong. The representatives from Ho Chi Minh City People's Committee, Department of Culture, Sports and Tourism, the Association of travel Ho Chi Minh City in coordination with the airlines services, business travel organizations came to the airport to receive the flight number VN120 of Vietnam National Airlines - Singapore Airlines from Frankfurt (Germany) to Ho Chi Minh City at 7: 20 am, carrying 315 passengers. 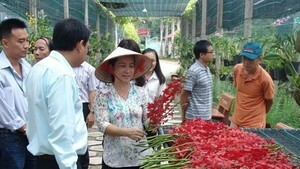 Most of the tourists were from Europe and they were the visitors who "broke ground " Ho Chi Minh City tourism. Next, a group of 150 passengers on flight CX767 number of Cathay Pacific from Hong Kong to Ho Chi Minh City at 10 am 25. Many international visitors said that they came to Vietnam for the first time and were quite surprised and happy of the welcoming ceremony for them organized by the Vietnamese tourism in the first day of the new year. They were happy being welcomed by city authorities and impressed by the beauty of Vietnam and the hospitability of local people. Mr. La Quoc Khanh, Deputy Director, Department of Culture, Sports and Tourism Ho Chi Minh City, said the ceremony to welcome the first international tourist group to Ho Chi Minh City is an annual activity of the tourism industry of the city. “This is also the message of Ho Chi Minh City - an attractive tourist destination, safe and friendly for international travelers and expatriates to visit the country”, he added. The city’s tourism industry is trying to improve the quality of services, diversify products, ensure visitor safety, and keep service prices stable. In 2012 HCM City received 3.8 million foreign tourists, representing a year-on-year increase of 8.5 percent, and accounting for 56 percent of the total number of foreign visitors to Vietnam. Its revenue reached VND68 trillion, or 42 percent of the country’s total revenue from tourism services.